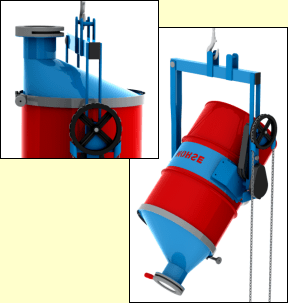 Model 185A below-the-hook drum pourer shown. Choose the correct drum dispenser for your drum. drum with Morse drum carriers. These drum dispensers allow you to tilt drum 360 in either direction. Lift and invert drum with drum faucet in place. 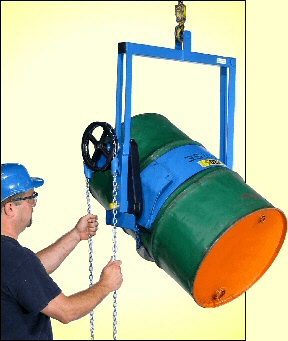 Below the hook drum carriers to tilt and pour drum with your hoist or crane - Drum Tilters - Morse Kontrol-Karriers. More than just a drum inverter or drum dumper... ...drum carriers for controlled Drum Dispensing.